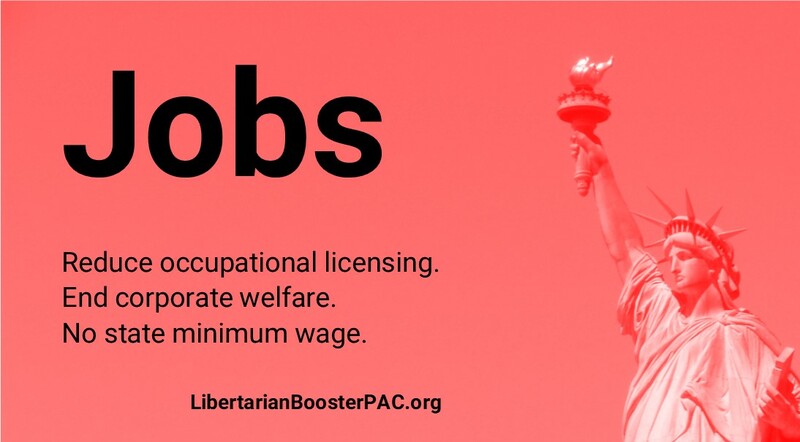 Libertarian policies will get the government out of the way and lead to a better job market in Virginia. People can apply for whatever jobs they want and can quit whatever jobs they don’t like. By the same token, employers should be able to hire whichever applicants they want, and to fire whoever they want. If an employer and employee want to strike a deal, the state should not interfere with rules like minimum wages. People also should be able to offer whatever services they want. Unfortunately, the state currently imposes a variety of mandates, regulations, and prohibitions. We want to get rid of many government-required occupational licenses. The state also interferes with the job market by giving special subsidies to well-connected businesses. This is sometimes called “corporate welfare.” We want to get rid of it. People should be able to purchase services from anyone they want to. Currently, the government prohibits people in many professions from offering services unless they have a government-issued license. In some cases, it’s helpful to know that your service provider has been properly trained. However, it’s your choice how much to worry about it, and a government license cannot guarantee quality. If you’re getting a haircut, maybe you’re more worried about a barber’s reputation than whether the barber has a government-issued license. The state has been requiring licenses for more and more occupations. The claim is that the licenses are important for public health and safety, but that’s not always true. Often, these licenses are just a trick to keep entrenched service providers from facing more competition, and to provide training schools with a guaranteed flow of money. Mandatory licenses make work much harder for people who are poor and busy. If you have a big family and not much income, it’s very hard to spare the time and expense to jump through the hoops to get a government license. We should replace mandatory government licensing with optional private certifications. Private certifications are already used in a number of industries, and they give customers information about a service provider’s training. If you only want your hair cut by someone who is certified with 1,500 hours of training, you can make that choice. In 2018, the only Libertarian State Senator in Nebraska, Laura Ebke, sponsored a bill to reduce the state’s burdensome occupational licensing mandates. That bill was signed into law. Virginia should pass something similar. You can probably get any company to move to Virginia if you pay enough. But it’s unfair to the competitors in the state, and by pushing up the tax burden on everyone, it suppresses the job market for everyone else. Corporate welfare does not create a net increase in jobs. Government should not distort the markets like this. We should end these subsidies. Governments often use the excuse, “Other states are doing it, so we have to do it too.” That’s a fallacy. Every time one of these subsidies passes, it drives up the tax burden and makes the state more hostile to business generally. Minimum wage laws are just plain bad. Rather than help unskilled workers at the bottom of the ladder, they tend to hurt them. Minimum wages destroy jobs. They make it harder for employers to offer training positions to young people. They encourage replacing human labor with automation. Even worse, this all leads to more state spending on unemployment. In 2018, the General Assembly unfortunately passed House Bill 1554, which created a new license for “master barbers” on top of existing licenses already on the books for other barbers. But they also passed Senate Bill 569, a small step forward, which allowed students and apprentices to do construction work without a license, if they work for a licensed contractor. In 2018, the General Assembly passed House Bill 665 and Senate Bill 547 to give subsidies to coal companies, and also to renewable energy companies! Whatever they were trying to achieve, they certainly made Virginia taxpayers poorer. In 2019, the General Assembly passed House Bill 2356 to give $750 million in subsidies to commercial giant Amazon, to get the company to build headquarters in Virginia. That’s unfair to every single other business in Virginia.